On Tuesday, May 23, the RHS Music Department held its annual Music Banquet. The banquet started off in the cafeteria with food catered by Mrs. Karen Parlee, Madison Parlee’s mother. After, the banquet transitioned to the auditorium for the awards portion of the ceremony. As the RHS Class of 2017 approaches graduation, they took part in Senior Issues on May 25 and 26. This year marks the twenty fifth anniversary of Rockland High’s Senior Issues. RHS nurse, Kathi Ryan organized the events by splitting up the senior class into eight groups over the two days of events. On Thursday groups 1-4 reported to the gymnasium for a presentation on College Fire & Life Safety, a presentation Lt. Scott Margolis started for the Class of 2014. It covers general fire safety behavior, distracted driving, overcrowding at clubs, theaters and more. Afterwards they completed the American Heart Association’s (AHA) Heartsaver CPR & AED course where all 144 graduating seniors are certified. Volunteers assisting with the CPR course were Tammy Ryan R.N. from South Shore VNA, Barbara Leary R.N. from Linden Ponds in Hingham, Pat Stone R.N., Lt. John Sammon from Rockland Fire and Firefighter-Paramedic Tim Royer from Hanson Fire. While groups 1-4 were doing that, groups 5-8 rotated among 4 presentations; “Who Wants to be a Millionaire” by Harbor One Bank, a Skin Cancer/Melanoma presentation where students had an opportunity to go under a UV light to check for damaged skin, a yoga class, and an open discussion with Rockland Police and Rockland CARES. On Friday the groups swapped presentations. Scott Margolis teaches the techniques of CPR for an infant. 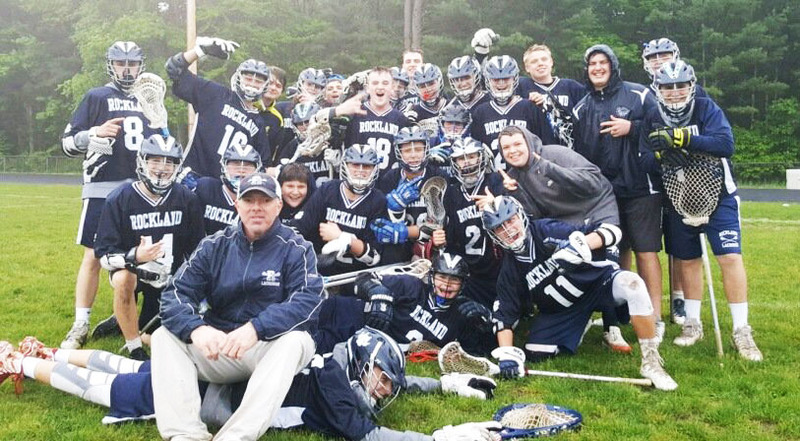 Boys Lacrosse Makes MIAA Tournament For First Time! Lacrosse is a newly found sport for Rockland High within the last four years. Back then no one really knew much about the sport, it was still so new. However, now lax is on the rise. The team’s growth has progressed each year since it started four years ago. This year’s team is confident that they are going to put Rockland lacrosse on the map. Kev Fennell claimed, “We are ready to take the South Shore League by storm this year.” Fennell is a junior who has played lax for all three years of his high school life. He’s very passionate about the sport and is very confident about how the team will do this year. Being the young team in the league, other teams are definitely looking to beat the Rockland team. Breadmore knows that teams are going to be tough, but he says he will not shy away. He will keep his head up and try to help his team in any way that he can. The team qualified for tournament with a convincing 14-1 win over Norton on May 25. This will be the lacrosse team’s first tournament appearance in its short history, showing the steady progress that the team has made since its beginning. Coach Dave Taylor has been the coach from the beginning and is certainly pleased with the record this year of 10 wins and 8 losses. The MIAA released tournament pairings on Saturday. Rockland, with a record of 9-9 got the 17th seed and will play a preliminary game against #16 Sturgis East at Simpkins Field on Tuesday, May 30 at 5 pm. The winner will play #1 seed Hanover on Thursday, June 1 at Hanover. Twenty teams qualified for the Division 3 South play-offs. Like Rockland, Sturgis is a new program, having only competed at the varsity level for two years. They qualified for tournament last year. The girls lacrosse team qualified for the postseason with a 16-1 win over South Shore Vo-Tech on May 24. The lacrosse team had never qualified since this is only their second year competing as a varsity sport. It is also only the fourth year there has been a lacrosse team. The girls did it at home on senior day! For more on their historic win go here. Update on tournament: The girls with a 9-8-1 record were ranked 17th in Division 2 South and will play a preliminary round game against Nantucket on Tuesday, May 30 in Nantucket at 4:30 p.m. The winner of this game will play #1 seed, Cohasset in Cohasset on Wednesday or Thursday. 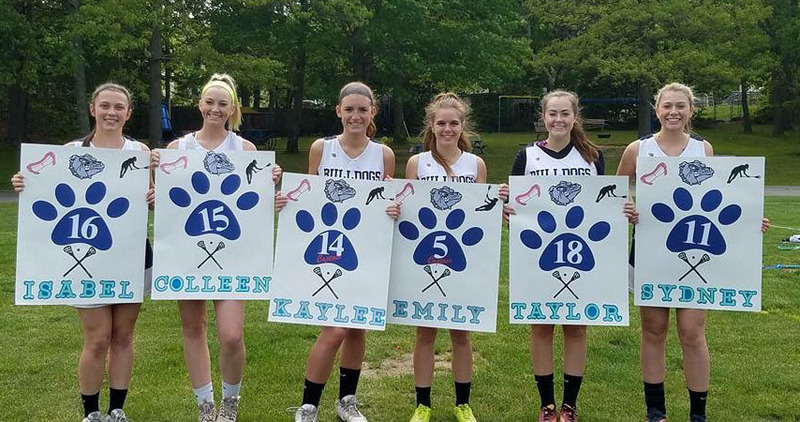 A big senior day for six lacrosse players! From left: Isabel Pica, Colleen Burke, Kaylee Patten, Emily Beatrice, Taylor Gallagher, and Sydney Ferguson. The combined junior-senior prom was held on May 19 at the Canoe Club in West Bridgewater. Before the junior and senior couples made their way from the high school to the Canoe Club, the seniors participated in a traditional Grand March in the gym, which ended with students having a “first dance” with one or more of their family members. Then it was on to West Bridgewater by bus. Everyone had a great time at the prom and everyone was up on the dance floor for most of the evening. The night concluded with the announcement of the traditional king, queen and courts for the juniors and for the seniors. For the juniors, the king and queen were Louis Casey and Natalie Draicchio. 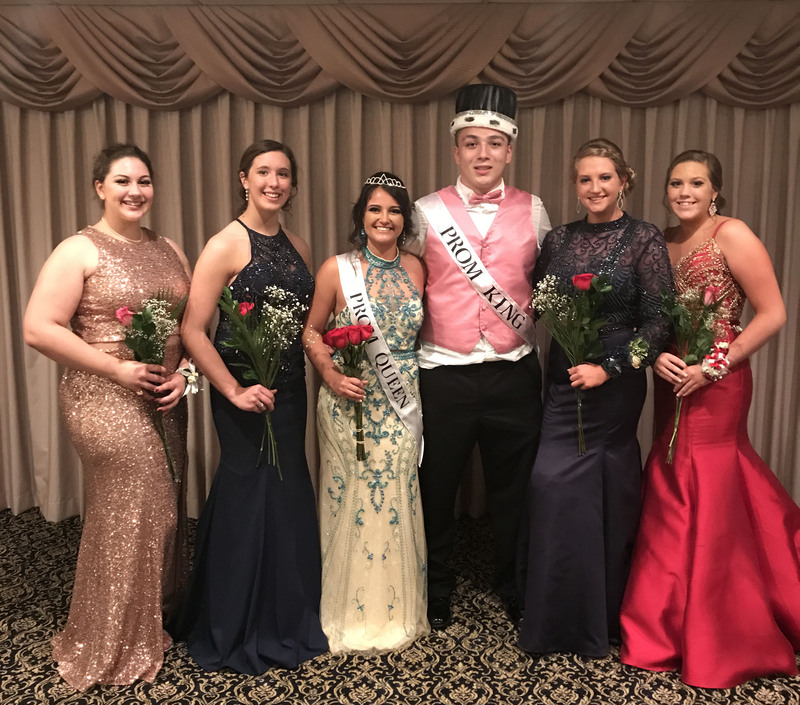 The court included: Jillian Donahue, Jaymie Atkins, Olivia Elie and Jillian Schofield. For the seniors, the king and queen were Brian McCullough and Jessie Lutts. 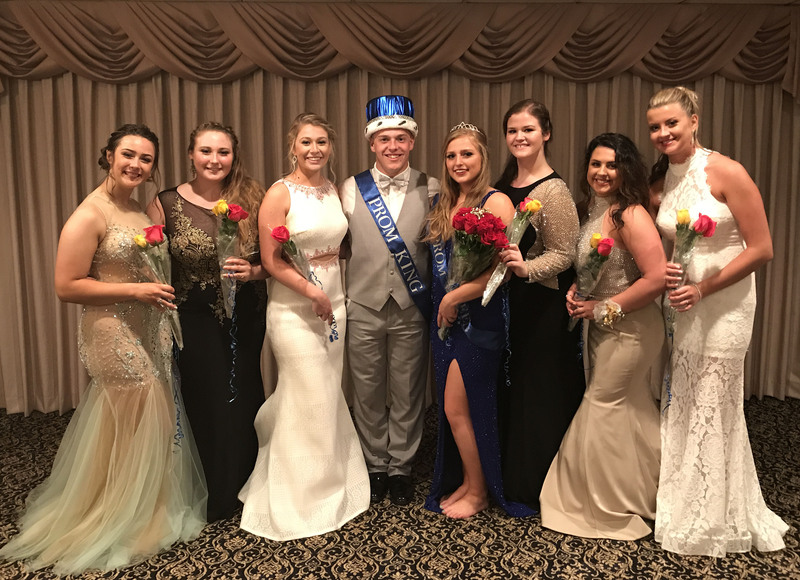 The court included: Erin Buckley, Hannah Millen, Sydney Ferguson, Shannon Lindahl, Talia Rindone and Alexa Murphy. After spending many years roaming through the halls of RHS, the Class of 2017’s time here is coming to a close. Today, May 23, is the bittersweet last day of classes for this year’s seniors and they’re feeling some mixed emotions about having to leave the place they have spent most of their life. 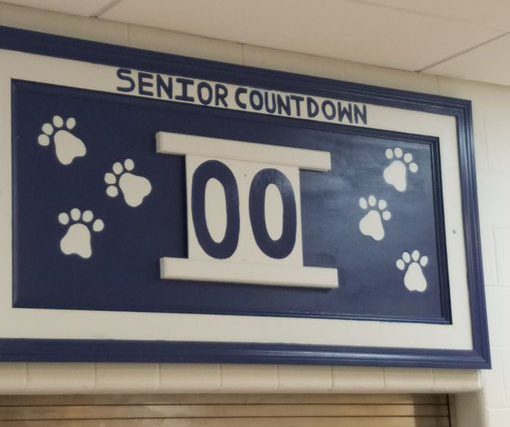 Although it is sad that it has come to a close, the seniors have an exciting, fun week ahead. Wednesday, May 24: Seniors who need to take finals will come to school. Students who have a combined total of 5 or fewer absences or tardies (of any kind) in each class between the dates of April 7th and May 23rd AND are in good standing with the main office may be exempt from taking final exams. Thursday, May 25: Seniors are required to attend Senior Issues from 8 a.m.-1 p.m. They will also have the opportunity to clean out their lockers. All senior obligations are required to be completed by Thursday as well (Detention hours, community service, book balances, food service balances, library book balances, etc.). Wednesday, May 31: A yearbook signing breakfast will take place in the RHS cafeteria at 8 a.m. Then at 9 a.m. seniors wearing their caps and gowns will parade through the Rockland elementary schools and middle school. Thursday, June 1: The RHS academic and athletic banquet will take place with a student dinner at 6 p.m. in the cafeteria. Students and parents are then encouraged to attend the awards ceremony in the auditorium. (Proper dress required). 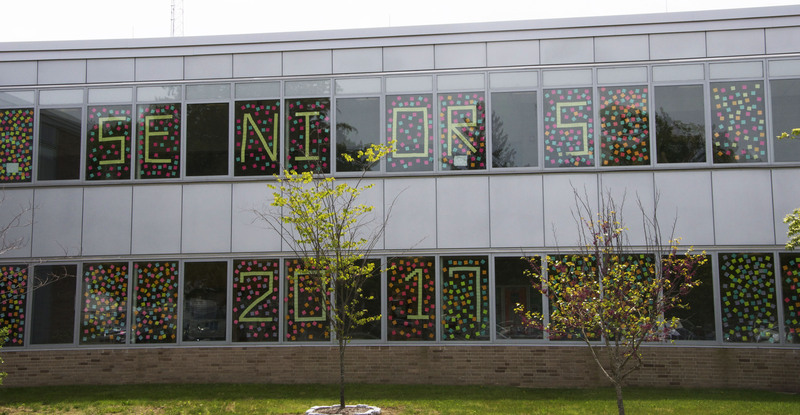 Saturday, June 3: Rain date for graduation is at 11 a.m.
Wednesday night, May 17, the National Honor Society Induction Ceremony took place. The ceremony started off in the cafeteria, where members, inductees, and their sponsors had dinner and exchanged gifts. When the clock struck 7, the ceremony moved to the auditorium to begin the induction. NHS President Colleen McCarthy gave a brief introduction before calling up seniors Michael McPeck and Dana Peck to announce the honorary inductees of the 2017 National Honor Society. McPeck delivered a light-hearted speech to induct Ms. Melissa Shaughnessy, and Peck’s heartfelt speech inducted Mr. Patrick Finn. NHS Secretary Noelle Atkins followed by calling the roles of each senior – each of the seniors’ full names, the college they plan to attend, and their future careers. 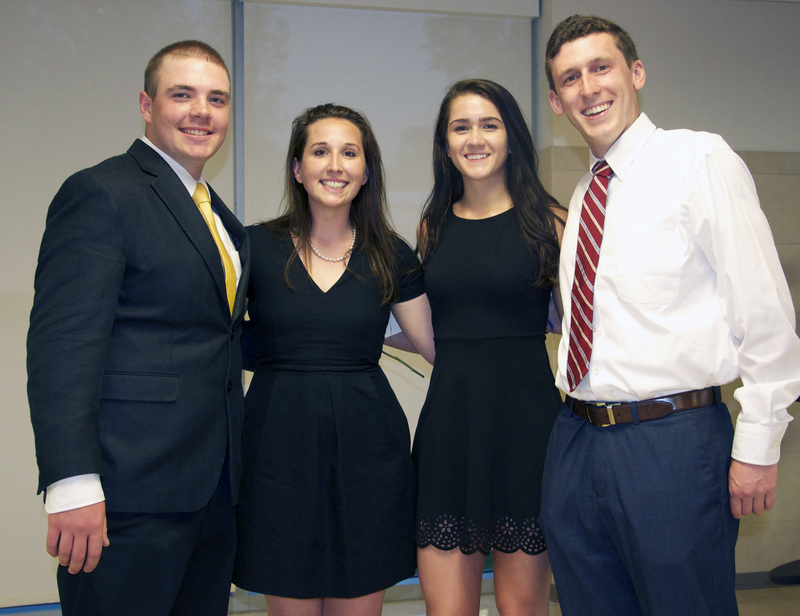 After McCarthy gave a rich history of National Honor Society, the next round of speeches came from four senior members of NHS who represented each of the four virtues that is the foundation of the Society. Sean Vo went first representing the virtue of Character, followed by Julia DiCenzo representing the virtue of Scholarship; next was Luana Lima representing Leadership, and the last of the virtues read by Mohammad Youssef representing Service. Each representative of the four virtues also had to use the flame from the torch to light their own smaller candle. Following the four virtues was Jessica Lutts and her recitation of the “Exemplification of the Torch” poem, where she had to hold up the center candle, similar to the Statue of Liberty holding the torch, and recite a poem representing each of the four virtues. After that heavily candle involved section of the ceremony, McCarthy inducted twenty juniors — Stephanie Blaney, Eden Dalton, Alexander Domina, Rebecca Elliott, Aiden Glennon, Margaret Jones, Meredith Long, Lily Matson, Ronan McNally, Saoirse McNally, Joseph Haughton, Harrison O’Brien, Matthew O’Brien, Rebekah Panaro, Christopher Penney, Zachary Peterson, Jillian Schofield, Sean Sugrue, Isabella Uong, James White — and one senior, Matthew Rocha. After the induction, senior members were recognized by McCarthy and Principal John Harrison, who handed the seniors a flower and a certificate respectively. The ceremony came to a close with the senior members and junior inductees forming the receiving line, and later making more memories during the time for dessert back in the cafeteria. Although this is usually a more formal occasion, laughs still came with it, from honorary inductee speeches to the tense moment of lighting the candles and releasing that tension collectively when the candles, not the tablecloth, were successfully lit. Mr. Finn receives his honorary induction plaque from Dana Peck. Colleen McCarthy, President of the NHS leads the ceremony. Twenty juniors were inducted into the National Honor Society on May 17. From left back: Ronan McNally, Joseph Naughton, Sean Sugrue, Harrison O’Brien, Eden Dalton, Aiden Glennon, Chris Penney, James White, Stephanie Blaney. Front from left: Saoirse McNally, Jillian Schofield, Alex Domina, Rebekah Panaro, Lily Matson, Isabella Uong, Margaret Jones, Matt O’Brien, Rebecca Eliott, and Meredith Long. Missing from photo is Zachary Peterson.